Wal-Mart worker Bene't Holmes (above, right) joined a candlelight vigil outside the Phoenix-area home of Wal-Mart's chairman of the board Monday evening. Wal-Mart Stores workers and union organizers say they will hold strikes in more than 20 cities Wednesday in their campaign to raise wages. The job actions are timed in conjunction with Wal-Mart' (WMT)s annual shareholder meeting, which takes place Friday in Fayetteville, Ark., near the company's Bentonville headquarters. OUR Wal-mart, a group backed by the United Food and Commercial Workers Union, helped orchestrate a candlelight vigil Monday night outside the Phoenix home of Rob Walton, Wal-Mart's board chairman. "I am trying to tell Wal-Mart that they should not retaliate against workers, and that they need to raise wages and respect us," said Bene't Holmes, a 25 year old mother earning $8.75 an hour at a Chicago-area store who joined the vigil. 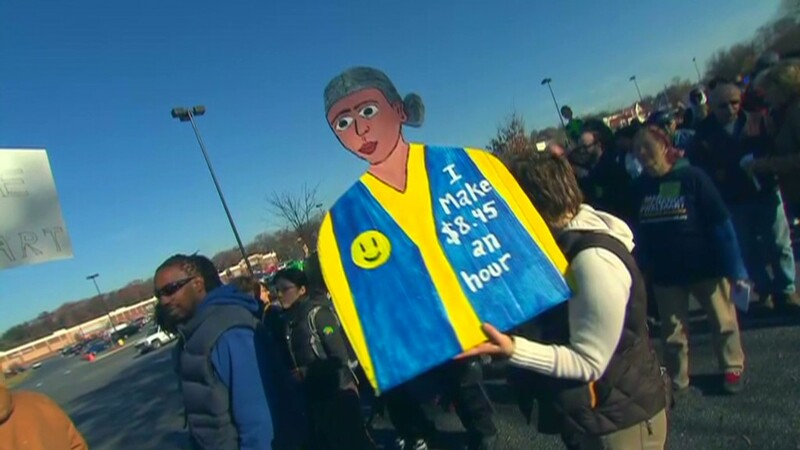 Protesters want Wal-Mart to pay associates at least $25,000 a year, and to not retaliate against workers who go on strike. A hearing is now underway in Oakland. Calif., to determine if Wal-Mart illegally disciplined or fired workers for taking part in strikes during 2012 and 2013. The National Labor Relations Board issued a complaint earlier this year contending Wal-Mart acted unlawfully. But Wal-Mart says it was within its rights as a company trying to conduct business as defined by the Supreme Court. 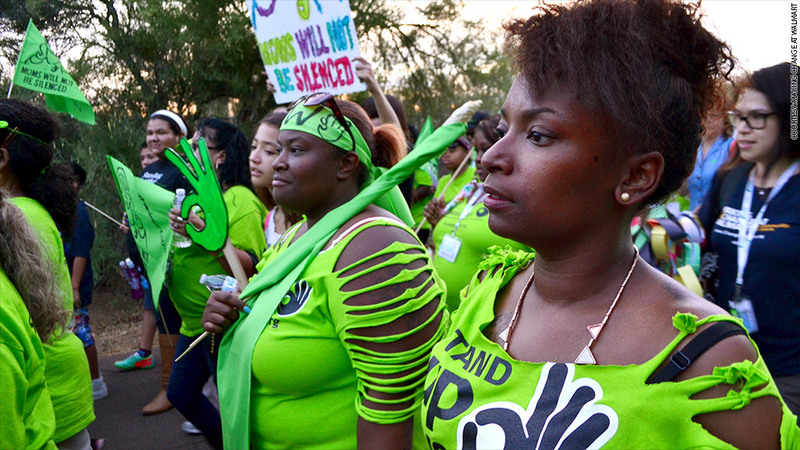 Wal-Mart workers and union organizers take part in a march Monday night to the Phoenix-area home of Wal-Mart's chairman of the board. There was a large contingent of women at Monday night's vigil. While women make up less than half of all retail employees, they constitute 55.4% of the industry's low-wage workers, according to public policy organization Demos. In a new report, the left-leaning group says a typical female retail sales person is paid $4 an hour less than her male counterpart. Demos says this costs female retail workers an estimated $41 billion every year in lost wages. Proponents for higher wages received a shot in the arm Monday when the Seattle City Council passed an ordinance to gradually increase the minimum wage to $15 an hour. 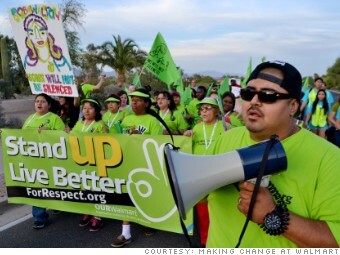 The fight for higher wages has been a recent theme across the retail and fast-food industries. McDonald's (MCD) workers and union organizers have staged strikes, even taking protests to the annual shareholder meeting last month. But Wal-Mart says it's looking forward to the "best week of the year" leading up to Friday's shareholder meeting. "It's not unusual to see the same union group stage events around our shareholders meeting," said the spokesman. "There's also a reason that the associates who are taking part in the demonstrations work for us. They know what a good job is."